Buckingham Palace has denounced claims that Prince William will take over a substantial part of the Queen's duties as "total and utter fabrication". The Mail on Sunday reported that the Queen was passing on more tasks to her grandson. The paper said the monarch was cutting her workload owing to her age. A royal spokesman told the BBC that Prince William was gradually taking on more engagements but there were no plans to by-pass Prince Charles. The Mail said it had obtained treasury documents showing a change in financial arrangements for the princes that revealed the shift in Prince William's role. 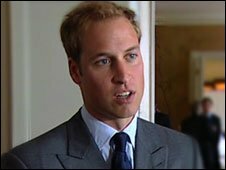 But the spokesman told the BBC: "Prince William is gradually undertaking more public engagements as he takes on more patronage. However, his focus remains for the foreseeable future on his military career." The Queen is 83 years old and has reigned for nearly 58 years.